Lichen striatus begins similarly to lichen planus, with small bumps (papules), but over a period of days expands to form a long streak or band of affected skin. It clears over a period of months without needing treatment. 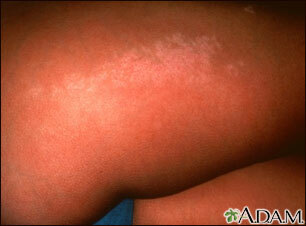 This condition is seen frequently in children less than 16 years old but, also occurs in adults.